The Government’s programme of welfare reform represents perhaps the biggest change to the welfare state since its establishment. The Social Security Bill had risen to £164.7 billion by 2009-2010, and was at that point identified by the Government as unsustainable. It rose further to £200 billion in 2011/12, a rise of 22% in real terms since 2005/06, equivalent to a rise of 2% of GDP. The Institute of Fiscal Studies predicts without on-going reforms to curb increases in public spending, non-interest spending will increase by 5.2% between 2016/17 and 2061/62, while revenues increase by less than 1%(http://www.ifs.org.uk/fiscalFacts/taxTables). 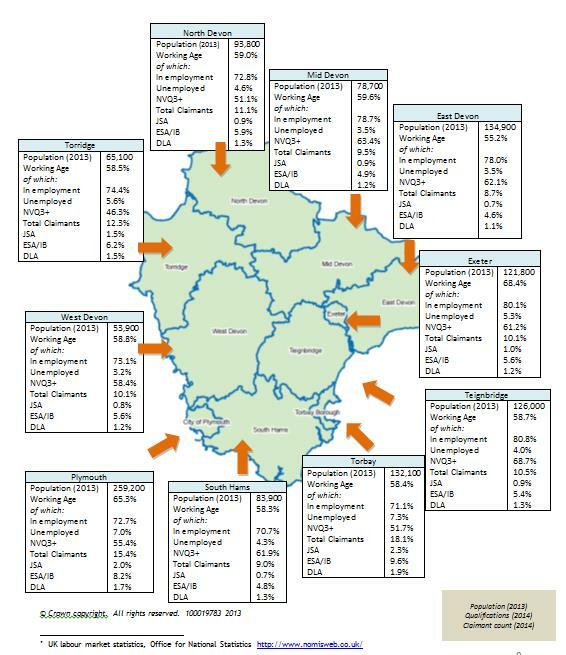 The Welfare Reform and Advisory Group produced a substantial report at the end of 2013 looking at the impact of reforms on Devon. The headline impacts identified in this report are striking. On the most conservative estimate, the reforms will take £258m out of the Devon economy in 2015/16 (https://new.devon.gov.uk/devonsp/welfare-reform). 159,000 working age households will be affected, with 61% of the losses falling on households in which someone is in employment. These losses will average around £1,600 per household, but ill and disabled people face greater losses. The report identifies substantial opportunities to be opened up. The reforms provide a focus for local action to promote jobs and employability, to support people to gain financial, digital and employment skills, and to help thousands of people whose circumstances have been affected by the changes in the welfare system to secure a better future. Figure 5.7 shows a breakdown of various benefits by local authority. This shows the variation across the county, with the highest levels of all benefits in the eight Devon districts being claimed in Torridge.